Enchanted Excurse: Are You In A Defiant Mood Today? Are You In A Defiant Mood Today? Evening Loverlies! I am worried I won't be able to read 100 books this year. lol Here I am worrying again about something eh? Well I just get discouraged easily sometimes. But I am going to try my best to finish 100 books this year though. That is the best I can give I think as long as I try hard. I just keep seeing that little widget on my blog/goodreads that says, you are two books behind. Well SHEESH! I need to catch up, but I will in time hopefully. 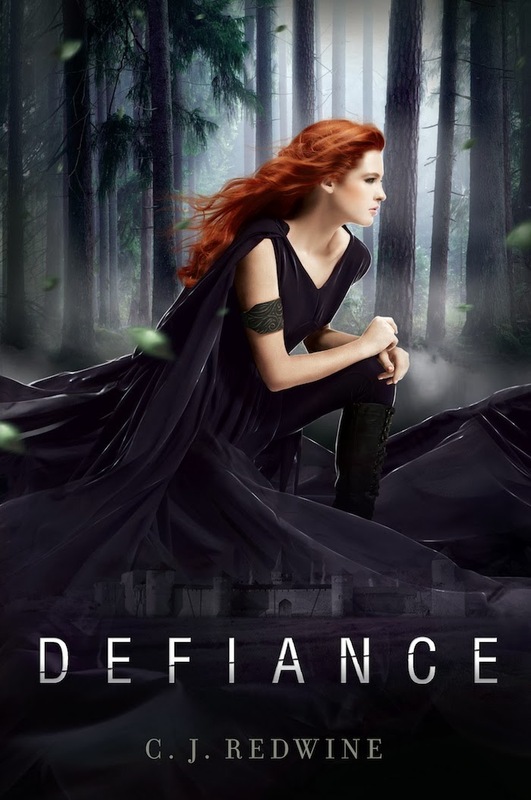 lol I just finished reading Defiance by C. J. Redwine. I have also been conversing with my friend about redoing my blog design. I just want it to look more professional and more fitting to the name of the blog. Fairy tale like almost. :) I'm excited because we are almost done with the look. YAY! Alrighty, the book review! I love the cover of the book, it is pretty. This book is about a character named Rachel. It starts off talking about how her dad was sent on a mission by the commander. He was sent to grab a package the commander wanted. Her father doesn't come back and they announce his death. Rachel is given to Logan, so he can be her protector. Each woman in this city has a protector. When they come to the age of 18, they get dressed up in beautiful dresses and then have to go to a "coming out" type of event. They then have to wait for their name to be called onto the stage by the commander, and any man can try to claim one of them. Once a man steps up to claim them, their protector or father gives them away if they approve of whoever is claiming them. This frustrated me because it was so old school thinking. lol But hey it's the story. Logan grew up with Rachel after his mother was killed her father took him in. He trained him to be an apprentice and a tracker just like him. Rachel, after hearing of her father's death still believes he is alive. Rachel decides she needs to go look for her father in the wastelands, even if it can get her into trouble for trying to leave the city. The commander doesn't allow anyone to leave unless he sends that person out on business for him. The commander is basically the leader of their city Baalboden. He is not a nice man at all, he is very power hungry. If you don't follow his law, you are dead. There is yet another reason for people to not to leave the city, if you do you could also be dead by a monster that roams the wastelands. I will agree I didn't enjoy this story as much while reading it. It is very emotional and suspenseful. There is a lot of grief and I felt awful for the characters. As I think about the story after reading it though, it is a it interesting. I do have to know what happens at least in the next books. So I will rent them from the library just to see if the story turns out to be more likable then. :) The chapters were written as Logan and Rachel's point of view. It would switch each chapter, so you need to make sure you read if it's Logan or Rachel speaking. Otherwise, you might be confused. This book made me think of steampunk a bit. Because the material they would invent with was copper. When I think Copper and wires I think steampunk. lol Try the book though, you just might enjoy it! Ta Ta For Now!